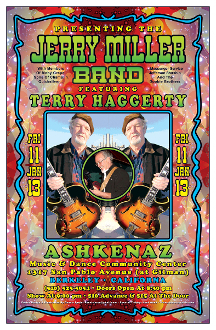 Jerry Miller Band featuring Terry Haggerty - 1/11/2013. Ashkenaz - Berkeley. Poster design by Dennis Loren. Poster measures 12 1/2 x 19 and is a digital print. It is signed by DL. Mint condition. Ships ina tube.